A GUI mesh is a non-flat GUI object based on an arbitrary mesh. If the mesh contains several surfaces, the same GUI will be rendered on each of them. The GUI will be rendered according to the UV mapping of surfaces. Basically, the GUI mesh is a non-flat display, on which GUI is rendered. You can interact with such GUI the same way as with GUI created via the Gui class. You can add a GUI mesh via UnigineEditor and then assign a widget to it via UnigineScript. On the Menu bar, click Create -> Effects -> GUI Mesh. Specify a mesh on which the GUI will be rendered. Place the GUI mesh in the world and specify the required parameters for it. 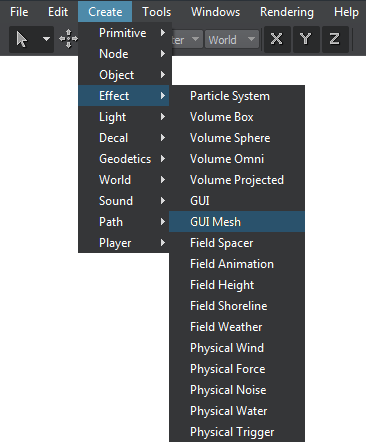 In the script, get the GUI object via the engine.editor.getNodeByName() (or engine.editor.getNode() if you have the node index) and assign a widget to it by using functions of the ObjectGuiMesh class. Indicates if the mouse cursor should be rendered in the GUI mesh. Distance at which the GUI mesh becomes controllable. Width of the GUI object in pixels. Height of the GUI object in pixels.